Once you have selected a domain for your new portfolio you will see the following screen. At this point, your portfolio is configured at Dub with your domain, but you still have to make a change to your domain at your domain registrar. This change essentially points your domain to your portfolio. Below, we explain two different methods of doing this. What's with http://mydomaincom.dub.io in the above screenshot? Notice how in screenshot 1, it says the portfolio is also available at a URL that was provided by Dub. Each time you create a portfolio, Dub gives you another URL for your portfolio, which is Dub's sub-domain. This sub-domain is useful if there is ever an error in setting up your domain and you still want to visit your portfolio. It also comes handy when setting up your domain name via a CNAME record, which we will explain below. Most of the time, when you buy a domain name, your domain registrar will provide a basic DNS server with pre-defined settings for your domain. In order to point your domain to Dub's portfolio, we can add a CNAME record. A CNAME record stands for canonical name and essentially it says when a user types in abc.com, forward that user to def.com in the background without changing the address abc.com in the browser's address bar. And that's exactly what we are going to do here. 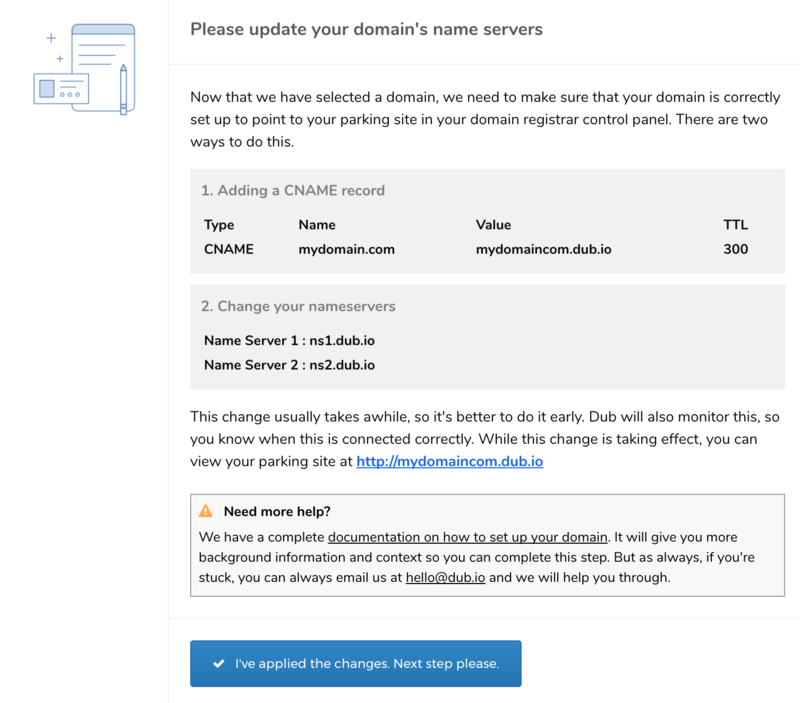 We are going to tell your domain registrar that when a user types in mydomain.com, forward that user to the sub-domain mydomaincom.dub.io provided by Dub seamlessly. In the following example, we are going to show you how to do this in GoDaddy, but other domain registrars should be quite similar. Host is usually the prefix to your domain that you want to use for parking. If you specified the prefix in the previous step, then please add the prefix here. Otherwise, you can leave it blank or type in "*" or "@" to indicate that your root domain is to be redirected. In the "points to" section, type in the sub-domain for your portfolio provided by Dub. Lastly, set the TTL (time-to-live) to an integer value (e.g. 3600) for the change to be applied quickly. For some domains, you may already have a CNAME record with the same "Host" value. In that case, please delete it before adding your new CNAME. Save the changes. This change will take some time (up tp 48 hours) to take effect. While this change is being applied, you should be able to access your pages via default Dub's sub-domain provided. In order for a domain to display a website, it needs a DNS server which translates the address to a location of a website. When you buy a new domain name, by default, it will use a DNS server provided by your domain registrar. When you configure your domain using CNAME as explained above, you are essentially using your domain registrar's DNS server. However, you can choose to use another DNS server by changing the name server settings. 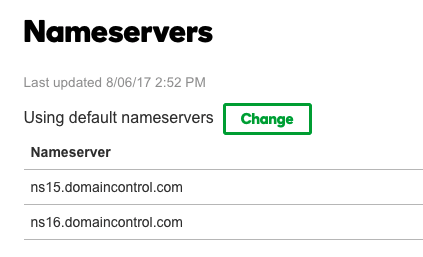 Change the name servers to the below two name servers and save. This change will take some time (up tp 48 hours) to take effect. While this change is being applied, you should be able to access your pages via default Dub's sub-domain provided. Though both methods work and are relatively simple, they do work slightly differently. For many people, just changing the name servers can be seen as a simpler approach, since you can 'set it and forget it'. However, for some, you may wish to have a full control over your DNS settings. For example, you may need to set up Mail Server settings, in which case, you will probably need to use CNAME. If you're using the existing DNS records provided by your domain registrar, we recommend you to use the CNAME record approach, whereas if you want to just quickly park your domain, changing name server should be more simple and straight forward.